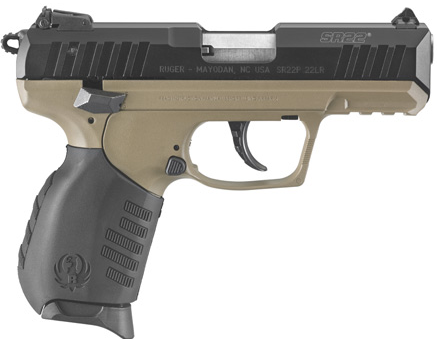 Ruger’s SR-series of firearms has been around for about a decade. It is comprised mostly of centerfire pistols. The first in the series was the SR9 semi-automatic (9mm), and afterwords several different models were released. In 2012, Ruger introduced its SR22 pistol, a semi-automatic chambered in rimfire .22 Long Rifle. This model is often mistaken or otherwise confused with the SR-22 Rifle (which is also chambered for the .22 LR), but these two were actually released a few years apart. 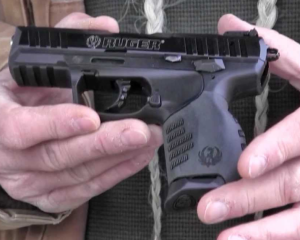 They share some features (cartridge, action, name), but are otherwise very different firearms as you will learn here in our Ruger SR22 Rimfire Pistol Review. MSRP: $439-479 (depending on the model). You can tell from the specs that this is a relatively small gun. Not as slim or petite as the Ruger SR9c or Baby Glock, perhaps, but still pretty close (in dimensions) to pocket sized guns of that sort. It is one of the more recent additions to the SR-series, and it is doing very well. It is a popular weapon, because it represents the best of both worlds: everyday carrying and target shooting. The SR22’s frame is made of high-strength polymer, the slide is aerospace-grade aluminum, and the barrel is stainless steel. The trigger uses a double-action/single-action system. This pistol is fairly ambidextrous, with its thumb safety, magazine release, and decocking lever all being suitable for right- and left-handed shooters. 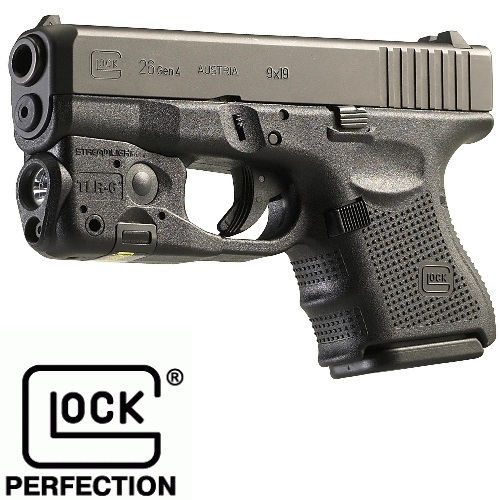 Two single-stack 10-round magazines are shipped with this gun, as well as two interchangeable grips (slim and wide) and two pinky-finger floorplates, for those who wish to have a tighter hold on their weapon. The SR22 also features a picatinny rail below the barrel, for quick and easy mounting of accessories. What I am about to say may be true to any handgun and/or cartridge, but I feel that especially with .22LR, it is important to use better quality ammo. This is definitely true in the beginning when you are trying to a get a feel for a new handgun. .22LR cartridges are cheap enough as it is, so it is better if you invest a bit more time and money, and get yourself some good ammunition. The low-end kind of ammo can (will?) cause the gun to be less effective, in the short and long run of things. That being said, the SR22 itself works great. It is a nice little gun, and it is no wonder it has such a great reputation for being the close friend of gun-competition enthusiasts and everyday plinkers alike. This gun is one which is not necessarily meant for self-defense or home defense, but more for fun. As far as I am concerned, it is the type of gun which you would take out to the range, and use to vent some frustrations or aggression, or simply to have a good time. There is something very therapeutic about firing a gun, for me anyway, and it is part of why I love handling firearms. It is important to remember, amidst all of the talk about guns and ammo, that not all firearms are designed to be deadly weapons of war, conflict, and heated altercations. True, the original pistols were weapons, designed to take lives and win battles. There is no getting around that fact, and I will certainly not attempt to do so. 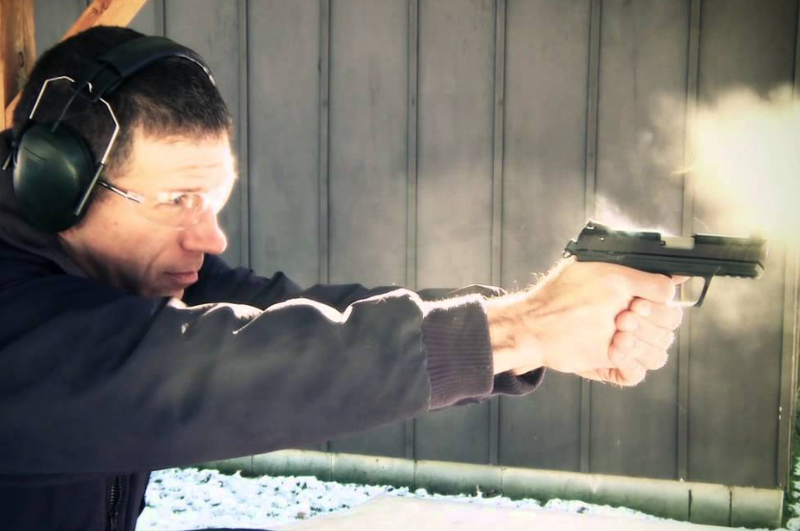 But – some guns, like the SR22, are designed for recreation more than anything else. They are designed for sports, self-development, and outdoors activities. Could they be used to wound or kill? Of course. It is still a high-speed bullet being shot out of that muzzle, after all. But the SR22 is a nice reminder that there are other types of guns out there, and that is an important distinction to make, in my opinion. The SR22’s aluminum and polymer build mean that there is very little weight to this gun, and the .22LR cartridges ensure that the recoil is pretty minimal. The shooting was consistently good, its performance was satisfactory, and I only had one failure to feed (which was probably ammo-related) while I was firing the thing. It didn’t absolutely wow me, but then again I didn’t expect it to. It is simply a fun shooter. As a side note (kind of) – you want to be sure the magazine is inserted properly, since the trigger will not work otherwise. An audible click is heard when a mag snaps into place, so be sure to smack that magazine into the gun as you pop it in. The two standard 10-round magazines which come with the SR22 are steel with a blued finish. As mentioned, they are single-stack and come with the option of floorplates. Extensions, such as the Tandemkross “wingman” +5 magazine bumper, are available. These aim to increase your round count and help you spend less time loading mags. As far as the sights go: the front is fixed, and the rear sights have the option of being adjusted for windage and elevation. With ordinary three-dot sights, I always tend to mark the front sight a different color for quicker target acquisition. The factory sights are standard and work just fine. It’s not hard to adjust, and it holds its zero very nicely. Nothing too amazing or unusual about the sights. 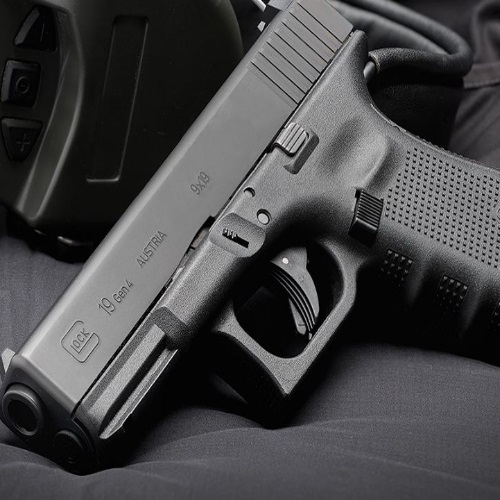 Aftermarket sights, such as tritium or fiber-optic night sights, are available. The ambidextrous manual safety is one of the SR22’s finer features. As long as the gun is in the ‘safe’ position, the firing pin cannot make contact with the cartridge necessary for shooting off a round. Furthermore, if the hammer is decocked by using the safety, the hammer is located far from the firing pin. If the decocker is not used, the shooter can use his or her thumb to move the hammer so it sits on the decocker hammer stopper (or” blocker”, as it is known in the SR22 manual). The decocker allows the hammer to fall without moving the trigger and firing a round, and at that point, you disengage the safety and fire. When in the ‘fire’ position, there is a red area which becomes visible. When the safety is engaged, that red area is covered by the lever. Another safety is the magazine. In order for the trigger to function, a magazine has to be inserted into the gun. If there is no magazine present in the gun, the trigger will appear to be limp and even broken. Pop a magazine in there, and it will spring back to life. Disassembling and reassembling the SR22 has got to be one of the simplest and easiest things to do, as firearms go. Remove the magazine, if one is present in the mag well; pull down on the takedown lever, located under the frame, and next to the trigger; take the slide all the way back, and it comes right out. Next, you can remove the recoil spring. That is the basic field stripping, necessary for maintenance and cleaning. The barrel is fixed to the frame and is meant to stay in place. Unless you have a reason for removing it, it is best to leave it to its own device. It is removable with the help of a 9/64th Allen wrench. To reassemble, re-insert the spring, put the slide back in place (making sure it is realigned with the spring and barrel), re-insert the takedown lever, put your magazine back in, and rack the slide. The most difficult part of reassembly is getting that slide back on properly. It may take a few tries, but once you learn the proper motion, it becomes a lot easier. Tip – do not try too hard. Don’t force it into place. Allow the motion to be a more natural one and it will fall right into place, perfectly aligned. The manufacturer suggested retail price for the SR22 varies from one model to the other, the cheapest being the 3600 at $439. The 3600 features a black anodized finish on the slide and a stainless finish on the barrel. The more expensive ones feature a silver slide finish (model 3607, $469), a threaded barrel (model 3604, $479), or a longer 4.5-inch barrel (model 3620, $459). There are several other models on the Ruger website, which specify that they are sold by exclusive distributors, thus have no price. SR22’s are still being manufactured today, and the street price for such a gun is considerably less than its suggested retail price. You can find all of those models mentioned above for way under $400 in many online stores, and the prices at local gun shops is probably even lower than that. Of course, this does change according to model, and some people/stores apply custom finishes to their weapons. Do your research and find out which one is the one for you. The SR22 model 3604 includes a threaded barrel which accepts any ½-inch-28 (aka class 2A) muzzle device. The 3604 comes with a thread protector, thread adapter, and handy wrench. Any threaded barrel accessories (such as a sound suppressor or flash suppressor) need to purchased separately. There are those who purchase threaded barrels for their guns for other reasons, such as improved aim capabilities. This is not a good reason to do so, in my opinion. That extra sliver of an inch is probably not going to be the life-changing accessory some make it out to be. Some people buy guns which have a threaded barrel as a factory standard. Another reason people buy threaded barrels is the tactical factor. Some guns just happen to look better with a threaded barrel. Some people pick them up and attach them, even though they have no intention of purchasing a sound suppressor, as an aesthetic thing. Far be it from me to judge. 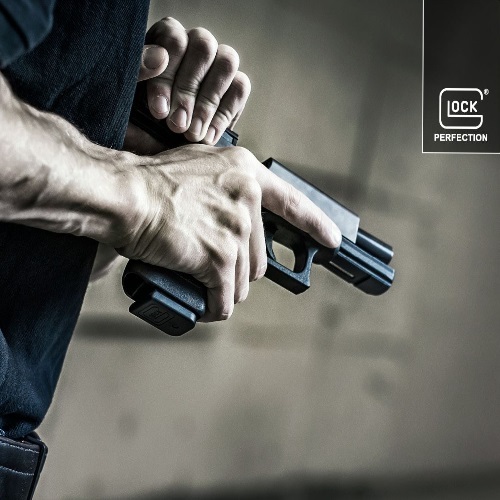 The Intimidator, by Pro-Tech: An ambidextrous belt and clip-on holster. It is meant for a SR22 with a laser attachment, but the SR22 will fit in just as snugly without one. It has an adjustable spring-loaded thumb break, and its outer layer is high-strength nylon. Inside, vinyl lining keeps away moisture, while foam padding and nylon make for an extra comfortable carrying experience. 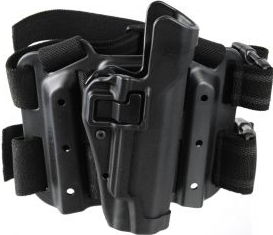 OB-29SC, by OutBags: An over-the-waistband belt holster with a magazine pouch. Made of sturdy, heavy-duty 600D nylon. Comes with an adjustable thumb break. Comes with a belt loop and clip. Available in left-handed or right-handed draw. Evolution, by Fobus: A paddle holster made of kydex, allowing faster access and long-lasting protection. The paddle design allows for a user to be beltless, and this holster boasts great retention without the need of a thumb break. A retention adjustment screw is also there, for those who want to fine-tune their carrying. LaserMax: This rail-mounted, adjustable laser for the SR22 has an ambidextrous switch, and a 10-minute automatic time-out function. Steady or pulse beam options. 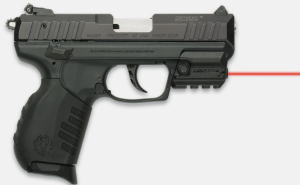 Crimson Trace: Available in green or red, Crimson Trace’s lasers are also adjustable, ambidextrous, and have an auto shutdown function of five minutes. Features steady, strobe, or momentary laser beam action. Micro-Tac, by Truglo: A green laser, ambidextrous activation. On and off, no other modes. Fits any weapon with a picatinny or weaver rail. Very light and compact. 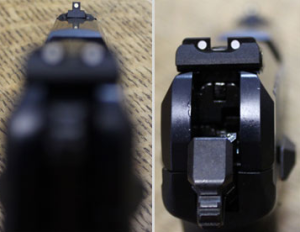 Replacement Sights: Whether fiber optic or tritium, it is something which can come in handy. Great for days with bad weather, low-lighting conditions, and in other dark scenarios where you need to stay on target. .22 Magazine Pouch: A Ruger leather pouch designed for .22 magazines. It is a handy companion to your SR22 or SR-22 rifle. Threaded Barrel Kit: Replace your factory barrel with a threaded barrel, using this kit. It comes with the stainless steel barrel, a barrel cap, adapter, and 9/64th Allen wrench. Note: this kit will not fit the 4.5-inch barrel of the 3620 model. Magazine Loader: There are different kinds of .22LR loaders out there. On the Ruger website there is one loader (by Maglula Ltd.), which is designed specifically for the SR22. 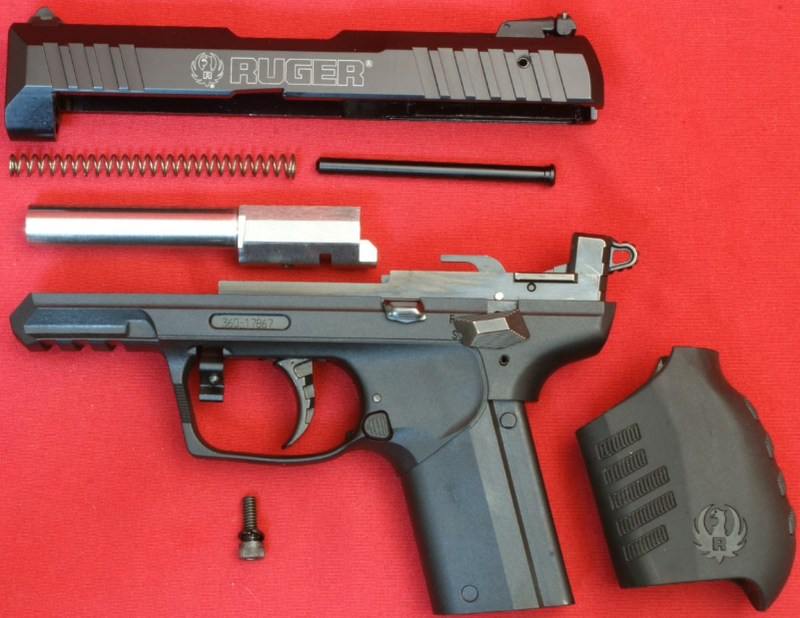 Other .22LR-chambered Rugers, such as the Mark series, will not be able to use this loader. Other options include Magpul and Hilljak, which produce loader for various .22LR magazines. The Ruger SR22 is a great little shooter, and anyone who enjoys shooting simply for the hell of it is going to have a lot of fun with this gun. 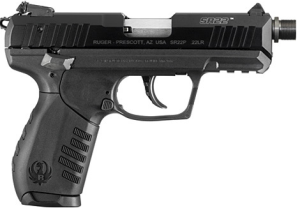 It is a pistol which stands out from the rest of the SR-series of firearms since it is basically an imitation of the Walther P22. Now, that is not a bad thing at all. 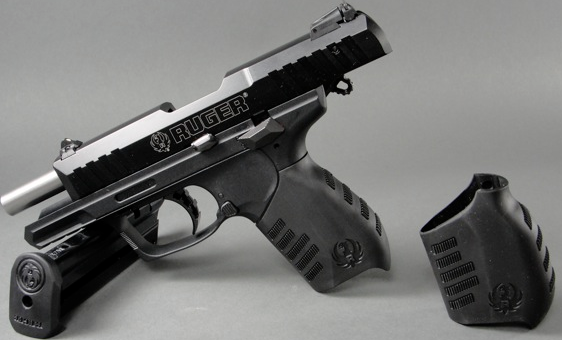 Ruger may have been mimicking a pre-existing gun with this design, but they make it their own by putting their Ruger spin on it. Traditionally, .22LR-chambered guns have been target guns. A lot of them are bigger and heavier than others calibers. The SR22, however, is a light, compact gun which resembles an ordinary carry gun in many ways, and as such it can be treated and carried very much like a regular gun. This gun is definitely worth the price, and will undoubtedly last a long time. Either way, Ruger’s limited lifetime warranty is there for you if you need it. Go on, then! Get yourself to the range, load up, stay safe, and have fun! Looking for more on great Ruger guns? How about the Mini 14, LC9, LCP or 556? It’s all right here at Gunivore! Quite enjoyed your well done review of the SR22. I also appreciated your observations on shooting as recreation–it was refreshing given the “tactical” obsession of so many reviewers, especially on you tube. And yes I agree with that even a .22 is a weapon that must be treated with respect–it’s just that some times it’s just fun to bang away at tin cans with a .22 pistol without envisioning a potentially deadly confrontation. I’m interested in the SR22 because it has the features I’d like: decocker, DA/SA, exposed hammer and ease of takedown. I’m also a Ruger fan. I’m considering the model with the 4.5″ barrel and wonder if you have any experience with or thoughts about that model. I’m glad I found this site and will explore it. Thank you. We’re thrilled you enjoyed our piece! The SR22 is loaded with great features but there’s not much of a difference between the 3.5″ and 4.5″ models. That is more of a preference issue, especially if you’re not going to be carrying. The added inch may give you a slight boost in accuracy and control, but it’s not a game-changer. I own both the 4.5 and 3.5 barrel SR22s. There is a HUGE difference in shooting and carrying size and weight of the pistol. The longer barrel is a better shooter hands down. The shorter barrel is a great CCW and fine shooter too.I compared the 3.5’s to both a Walther P22, and the Ruger SR22 3.5 inch I just traded the P22 for. I also own a Ruger 10/22 Takedown rifle with Hogue Stock and upgraded sights. Some of us folk can’t afford the bigger caliber to shoot and train, and just have to make do w/ opting for 22LR by practicing with regularly. I was hoping for some comments on the trigger of this gun. In another review I read, the author hated the trigger in DA mode. That review was back in 2012 however, and I was hoping that this was something that had been corrected? Did you happen to get the lbs trigger pull on the one reviewed? It doesn’t seem like Ruger has addressed any of the trigger issues with the SR22. The trigger isn’t awful but it’s definitely below average, especially for a Ruger. The SA trigger pull is definitely more comfortable while the DA is still notoriously shoddy.